The above picture corresponds to the below interactions. Mr. A started an in-the-moment cartoon during an interaction between he and D. D had just taken Mr. A’s turn in the matching game. When Mr. A reminded D that it was his turn, D continued on. 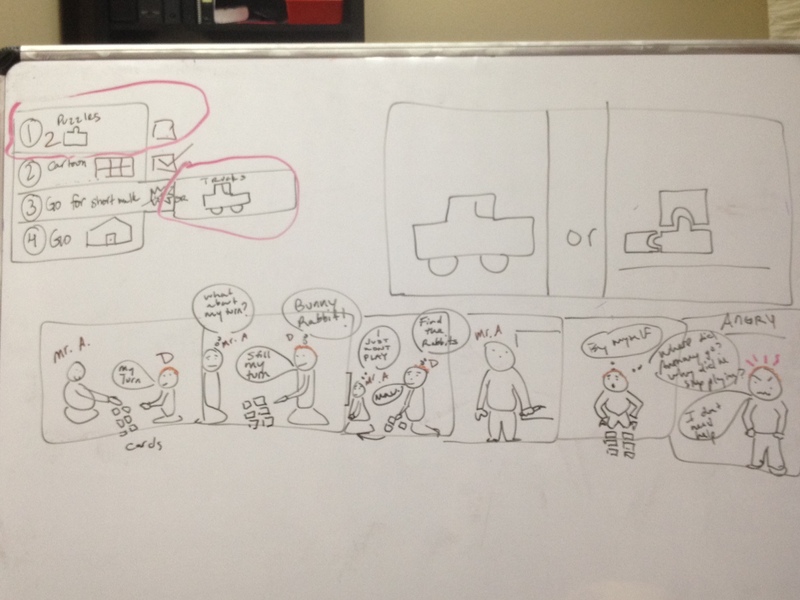 D and A then reviewed this sequential cartoon when D was done with the game. This was done to help D gain a sense of Mr. A’s perspective/feelings as a result of his behavior. There were 4 puzzles on the ground. “We only have time for 2”, Mr. A said, “if we’re going to get to the trucks (later in the schedule)”. D was not happy. He stated, “No. 4!”. Mr. A paused, recognizing the rigidity in thinking that D was struggling with, and moved his body away from D and towards the white board. Mr. A drew a truck beside a picture of a puzzle piece (representing D’s choice). He then told D that there was time to finish his current puzzle (the second one of the session) and then play with trucks, or finish all 4 puzzles and forego playing with trucks for the day. D stomped his feet to the board, picked up a big pink marker, and circled the picture of the puzzle and the truck. He stated, “Both!”. Mr. A reiterated the choice and then went voice off for a few moments (to give D some time to process the choice). He shared with D that if his body continued to present as threatening (throwing things), his mother would have to take control of his body and walk him out of the office and to the car (this safety intervention had happened once before). D finished his puzzle. Mr. A gave him space and began setting up an intriguing looking ramp for the “truck launch”. D’s eyes shifted to the ramp. He completed his 2nd puzzle and moved it aside. He began moving towards the ramp. Mr. A engaged with D, showing him the new activity with big affect and excitement. Mr. A quickly moved the remaining two puzzles out of sight (allowing D to see him do this). D began to play safely with the trucks and did not demand to finish the puzzles. After a few moments, Mr. A praised D for making a good choice. D drove the trucks, after a few minutes of play, back into their “garage” and transitioned out of the office and into his car. “See you next Wednesday” he said as he left.